During tonight’s provincial election debate, Tim Hudak and Andrea Horwath will spend plenty of time accusing Kathleen Wynne and the Ontario Liberal Party of wasting billions of tax dollars on a now familiar litany of scandals: ehealth, Ornge, executive salaries, and the infamous gas plant cancellations from the last election. But despite widespread interest in our series on the Scarborough subway and the accompanying timeline (created with research from Spacing editorial assistant Josh Sherman), the leaders, I predict, won’t attack Wynne for a transit decision that continues to stir controversy across Toronto, if not in the provincial arena. Yet we can — and should — ask what the orchestrated gutting of the $8.4 billion LRT master agreement, signed by Metrolinx, the City of Toronto and the TTC in November, 2012, will ultimately cost Toronto residents. And we can ask whether the Liberals, in effect, bought a Scarborough by-election last summer by agreeing to bankroll a subway while side-loading well over a billion dollars — the actual sum is unknown — in surplus cost to Toronto residents. What we don’t know is the full cost of extending the life of the nearly crippled Scarborough RT for the duration of the construction, nor the amount required to tunnel under Scarborough Town Centre. Metrolinx has also told the City it will have to cover $85 million in sunk costs associated with the LRT – roughly equivalent to a 4% property tax hike — as well as environmental assessment outlays. What’s more, as a Metrolinx business case analysis obtained by Spacing warned, the total project budget could balloon by 40 to 50%. Bottom line: brace yourself for Union Station-type cost overruns over the coming decade. Finally, as the Metrolinx memo noted, the 2031 projected peak volumes will be well below even acceptable LRT levels, meaning this subway extension will place a drag on the TTC’s operating budget for decades to come. Those shortfalls can be made up in only two ways: fare hikes or property tax increases. Pick your poison. We sent Toronto Centre MPP Glen Murray, the Liberals’ transportation and infrastructure minister prior to the dissolution of the legislature, several requests for his reaction to our series, but he did not respond. SPACING: Was council working with a complete understanding of the project costs when it approved the subway last fall? SPACING: We obtained a memo prepared by Metrolinx which warned that the subway could be 40 to 50%, or as much as $1.5 billion, more than initially estimated. STINTZ: It is my belief that council made a decision knowing there would be increased costs, although council [knew] it had partners in the federal and provincial government and decided to invest in subways. SPACING: Did you understand the complete cost of extending the life of the SRT for the duration of the subway construction? STINTZ: We knew we had to extend the SRT. SPACING: Do you know what the cost will be? STINTZ: Again, at the time we were making a long-term decision about the infrastructure, so we decided to make a longer-term decision and a longer-term investment. SPACING: The question was, was council’s decision based on an all-in cost? STINTZ: It was a decision based on working with our partners in building an extension to the Bloor-Danforth line because we had a partner in the federal and provincial governments. That’s how the decision was made. Council knew there were some costs we still needed to determine, but the decision was made to invest in the subway with our federal and provincial partners. SPACING: What about the warnings from Metrolinx about cancelation penalties associated with the Bombardier LRV order? STINTZ: Bombardier is a partner with the TTC. They build our subways and our LRVs. I can’t believe our partner would penalize us for ordering more subways. It is my expectation that Bombardier will continue to be a good partner with the city and the province. The Hurontario LRT [in Mississauga] has a scheduled order for LRVs that hasn’t actually been placed yet. If you use the Hurontario order instead of the Scarborough LRV order, it’s a wash.
SPACING: What happens if Metrolinx’s 40-50% budget overrun projection is correct? STINTZ: I would argue that the cost of going back to revisiting transit plans is greater than the cost of proceeding. People still ask me why we can’t get transit built in this city and it’s because we don’t stick to a plan. STINTZ: It was not the position of the provincial, the municipal or the federal governments. That is the position we’ve taken and that is the position I’m committed to. SPACING: What does it say when the elected officials disregard their experts’ advice? STINTZ: I think it’s a victory for transit that we have three levels of government agreeing to a transit project. The costs of going back to revisit that project are greater than the cost of proceeding. The irony of Stintz’ statement couldn’t be more glaring, as the Scarborough subway decision represents precisely the sort of revisiting that she – and John Tory – have condemned in the current debate over Toronto’s perennially stalled plans. If anyone’s counting, last fall’s subway ‘decision’ represents the fourth course correction since 2009 to the Transit City LRT plan initially proposed by former mayor David Miller and supported by a $10 billion-plus pledge from Queen’s Park. During that period, Ontario’s Liberals have rolled back the funding promise, agreed to indulge Rob Ford’s bid to kill Miller’s LRT plan, and then re-directed funds to the subway in spite of a formal contract that specified cash penalties. Council, of course, has demonstrated repeatedly, and amply, that it needs adult supervision when confronted with tough transit decisions; indeed, councillors across the political spectrum (including progressives like Paula Fletcher and Joe Mihevc) collaborated in a gambit that should never have even reached the floor of council. But the other (senior?) partner in this dance macabre, the provincial cabinet, is the one that’s supposed to behave responsibly, and with steadfastness. Instead, the Liberals have been actively complicit in the hyper-politicization of Toronto’s transit struggle, with electoral opportunism and short-term thinking always prevailing over evidence-based decision-making and the long view. By signaling council that they’re willing to play let’s-make-a-deal in the guise of deference to local decision-making, the Liberals are essentially telling Toronto’s politicians that they’ll indulge the irresponsible behaviour of our elected officials. There are no laws compelling governments to use good judgment; that’s why we have elections. But the question arising from this campfire of the vanities is whether new transit governance structures could at least mitigate the temptation to endlessly meddle and re-litigate previous political decisions. Imagine if the Metrolinx board, last year, had had sufficient independence that it could threaten to resign en masse if the province tried to tear up a signed contract with real cash penalties. Or, to take a less dramatic scenario, what if the Metrolinx board had had the latitude to pass a motion refusing to abandon its master agreement instead of merely asking its CEO to send off a threatening letter? It seems to me that whichever party emerges victorious on June 12 must begin the process of re-tooling the governance of the regional transit agency, with an eye to creating, and then institutionalizing, meaningful independence. In the tunnel of the mess that has been created, it’s the only light that I can discern. Czarina sticks to her bad plan. With Stintz’ demonstrated care-less-ness about fact-based and expert supported transit decisions, the truthiness of her the-costs-of-going-back to-revisit-that-project-are-greater-than-the-cost of-proceeding statement needs minimal parsing. What the f@&$. Karen Stintz ACTUALLY said those words? An excellent analysis of the failure of the Province to supervise not only its crown corporation, Metrolinx, but also provide governance direction to its municipal corporation, City of Toronto. Time and again the Province has failed to exercise its constitutional responsibility to ensure that its agencies are acting in the long term best interest of Ontario’s the financial costs and the infrastructure needs. The minimal role of Ford and his nation in telling this tale, perhaps undervalues the neo-liberal calamity that has throttled governments at all levels. Craven provincial by-election stupidity in Scarborough is merely heaped upon the juvenile antics of the Fords and their 3 stop subway cronies. One wishes there was an adult or at least a referee, who could call penalties and stop the financial bleeding and the arrested infrastructure build. The future is bleak. If it’s the future of Toronto transportation we’re talking about, there is no hope. Over the course of the fifteen years I’ve lived here the process of getting from point A to B has just gotten steadily worse and worse and worse. And it’s only going to get worse and worse and worse because of all this nonsense. The only reason I can still stand living here is because I’m lucky enough to have a job I can walk to. This Scarborough switch has really harmed planning: facts, imagination, fiduciary responsibility – all run over for politics, and on at least two levels. One can hope that this will be reversed to revert back to the LRT without too much delay and cost, and to that end, let’s hope that lots of people use this series as a go-to resource for their friends and their candidates. This whole discussion borders on the absurd. No one even mentions the simplest and least costly alternative which is to replace the existing RT cars that are very near the end of their service lives with new cars on the present route. Admittedly, during construction, the TTC engineers really screwed up by building a tunnel that is too small for anything other than the present vehicles (which are no longer available, except at an exhorbitant price) instead of following the original recommendation for the Scarborough (LRT)facility (which was to build the route to subway geometric design standards in order to eventually facilitate its conversion to subway). But then, engineers always were notorious for their inability to read. The fact is the Liberals are scared of losing any seats in Scarborough and will go whichever way the wind is blowing, responsibility be damned. I am still not convinced that the low ridership estimates are real. The Toronto Star published a story on Andy Byford, who commented that the Scarborough Transit line, whatever it will be, was at the high end of LRT capacity or at the low end of subway capacity. We should be building for the future, not for 6 months from now. Many people in Scarborough now drive because even with congestion, it is faster than a 65 to 90 minute trip each way to go downtown or even to mid-town. A route that minimizes transfers and is fast will get people out of their cars. It has for people in the Yonge Street corridor and for many people who live close to the other subway lines. Despite what Stinz claims. The LRT plan would not only be much much cheaper, but take less time to build. Another argument suggests that its too late because the Province would not come on board, or would choose to build its own inferior subway. I suspect that Wynne’s government (or Horwath) would likely follow council’s lead, given that Murray’s subway trial balloon was similarly low-balled. Stinz has been trying to get candidates to promise not to change their mind (after she’s hopefully gone), but Metrolinx is preparing for change by limiting study to work which applies to both the LRT and subway options. Hudak is more of a wildcard, particularly if PC’s win a majority government. Our Brief explores the broader question of the need to rethink/revisit the issue of transit governance on a regional scale, and the need for balance between politics and professional planning expertise. We agree that there is need for more independence at the Metrolinx board, but the Brief also explains the need for more local political legitimacy and accountability to avoid the kind of adversarial relationship where the planning of the project is so far removed from the politics that it creates conflict. We contrast the post 2009 Metrolinx model with Transport for London (TfL) model where “policy and planning are led by the mayor of Greater London with the expertise of TfL staff, and TfL is responsible for implementing the mayor’s Transport Strategy. Because politics is fused with planning, there is little room for an adversarial relationship to emerge. Yes, the Greater London model with a regional mayor is different from what exists in the Toronto region, but the larger point is that local political representation gives it legitimacy. In the Toronto regional context, there might have to be some role for the province because it is a significant funder. The original model for the board of Translink, Vancouver’s regional transit agency, is also worth exploring. Our recent report (http://www.neptis.org/publications/review-metrolinxs-big-move) critiqued Metrolinx’s BCAs, all of which were done after the Big Move Plan was approved. BCAs should ideally be ahead of the formulation of a transit plan, not behind. Just something to throw into the mix when one talks about governance. I’m been told that the narrow design of the tunnel north of Ellesmere was not a screw up by TTC engineers but rather, a deliberate redesign to ensure that only the UTDC Mark I vehicles would be able to fit through. *The reason why the CLRVs are so big and heavy is that they would have done double duty, operating at low speed on Toronto’s streets and high speed (in trains of up to 3 CLRVs) on the Scarborough RT and Etobicoke RT corridors. By all means, let’s build for the future, keeping in mind that the Sheppard subway carries one third of its projected ridership. Costing about $20 per ride, subsidized by Joe Taxpayer. @Richard Soberman: Your claim that the TTC’s engineers built too small a tunnel at Ellesmere for larger cars rings quite hollow. As I understand things, it was the company flogging the RT technology (for whom you worked for a time) that, through Queen’s Park, forced the TTC to “engineer in” this limitation to prevent a return to the LRT option originally planned for the line. I remember a presentation you made about RT vs LRT options in Scarborough (as part of a TTC study during the Transit City era). You wryly spoke of yourself as the person who “sold you the technology” in the first place, but who now changed your tune to advocate a return to LRT. Oddly enough by the time your report was published, you had flip-flopped again and there was no mention of LRT as the better option. Was this was TTC editing or another change of heart on your part? What’s up with the finch LRT? Is it still a goer? or was in cancelled with transit city? Any spades in the ground? 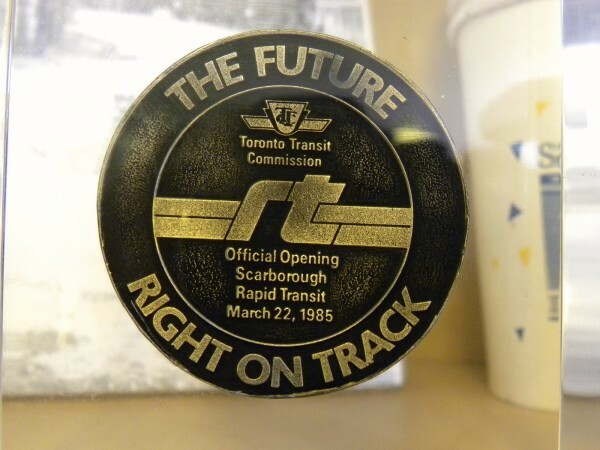 Been a lot of focus on Scarboro — but not much on the pokey Vaughn subway or the other former transit city components.